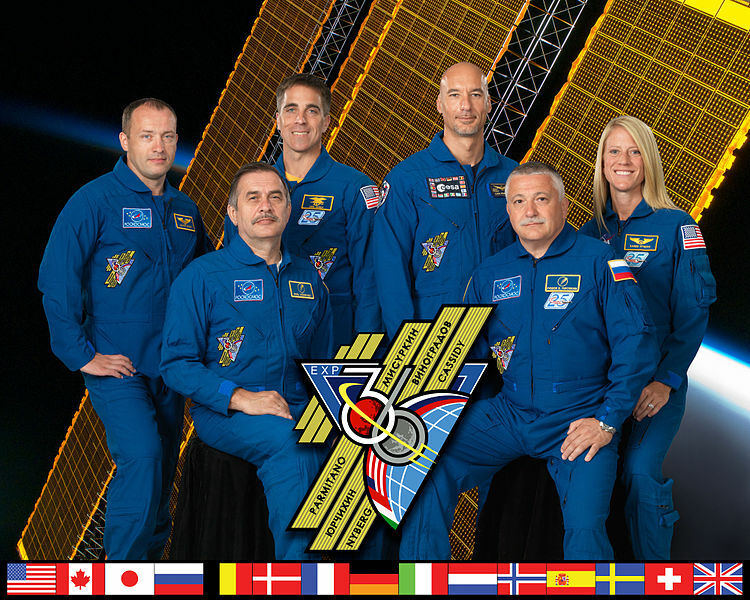 Every day, on board the ISS (International Space Station), the one and only human outpost in Space, three to seven astronauts of different nationalities, work actively together. Days are filled with activity and work becomes even more intense due to the constant condition of absence of weight. 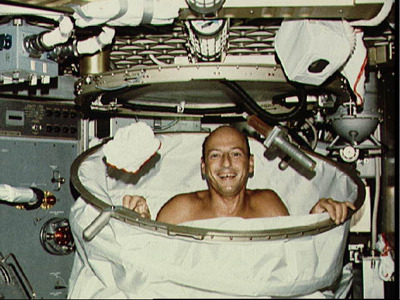 In fact, the astronauts experience the condition of fluctuating in Space. How do they spend their time on the ISS? To understand this, we shall follow the day of a hypothetical astronaut who, to make things more simple, we shall call Luca, after Luca Parmitano the last Italian astronaut, in time, to visit the International Space Station. Luca’s day begins very early. 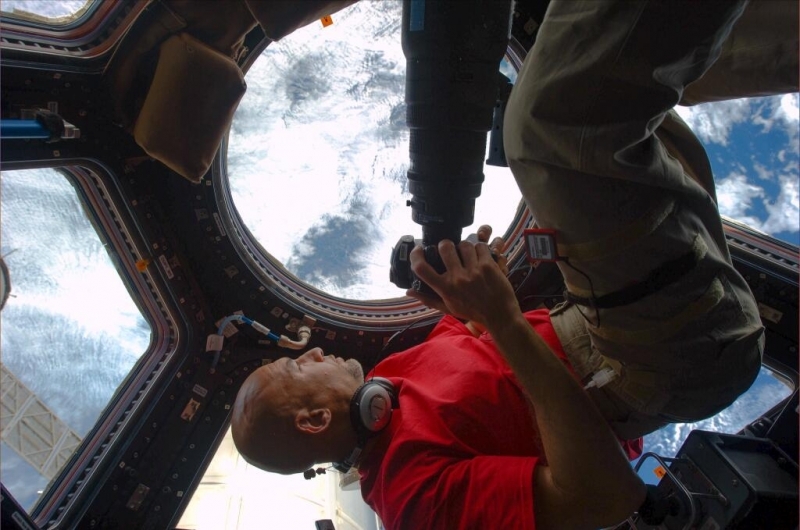 He wakes up at 5.50 a.m. And to speak of a precise hour of the day is rather strange, as the ISS completes an orbit around the Earth every 90 minutes, crossing all the time-zones. And so, theoretically, every 90 minutes a day passes, because the ISS completes an orbit around the Earth. In order to solve this problem of time, it has been established that the time indicated on the watches is Greenwich Mean Time. Now let us get back to Luca. He wakes up at 5.50 a.m. GMT. After a short time to realize where he is and shed any sleepiness, he immediately starts to work, and switches on the computer to read the Daily Summary Report, a daily summary sent by Houston at night time, where all the operations to be carried out during the day are indicated. While he reads the Daily Summary Report, Luca loves to drink some tea. This is a simple and relaxing action which however is somewhat more complex on the ISS: First of all the tea needs to be re-hydrated by positioning a small box near to a unit which fills in water and also heats the tea. Now all he has to do is drink. Not so easy, because everything, also the liquids, float in Space, not only the astronauts. If Luca were to take a cup and bring it to his mouth to drink, and if he were to tilt it, he would realize that the tea remains in the cup and does not even hint at sliding towards his mouth. In order to drink the tea, Luca must create a force that compels the liquid to move towards his mouth. The most simple thing to do is to use a straw. All the containers used for liquids are closed with a cap that can be broken with a straw. Once the liquid is in Luca’s mouth he will swallow it so that it moves down to his stomach, also helped by the peristaltic movements of his oesophagus. All drinks, even water, containing bubbles are prohibited because they remain in the mouth. In fact they are impossible to swallow. It is 8:00 a.m. GMT Luca starts his working day with the first of the two DPCs (Daily Planning Conferences), i.e. the conferences with the various organisms on the Earth which tell the astronauts how the day on board the ISS will be organized. Luca communicates with the Earth: “Houston, Huntsville, Munich, Tsukuba and Moscow: Good morning from Luca. We are ready for the DPC”. Obviously he speaks English, the official language in Space! 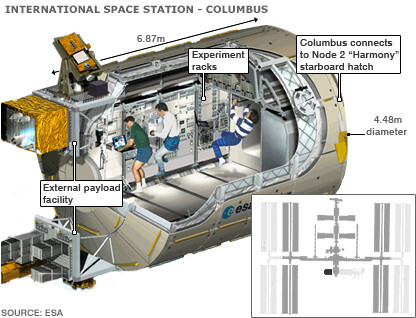 After this connection, the astronauts, and therefore also Luca, dedicate their time to specific work: scientific experiments on board the European laboratory Columbus, the real scientific heart of the ISS. Luca can make use of a number of racks with materials for experiments. In the Columbus laboratory also physiological studies on the astronauts are carried out: variations in weight, blood sampling and all types of echographic examinations (spine, heart, eyes). Now Luca concentrates on carrying out an experiment to assess the effect of microgravity on the human cardiovascular system. He ties two straps around his thighs, once these are inflated, the flow of blood from the upper part to the lower part of his body decreases remarkably, The experiment lasts about three minutes, after which the straps are rapidly deflated. From this moment two pressure indicators monitor the response of the cardiovascular system to the demand for blood in the lower limbs. One of Luca’s colleagues Fryod, is carrying out a study (GEOFLOW) which regards the physics of fluids. In other words, the dynamics of liquids that are normally inhibited by the presence of gravity, are studied. For example, Fryod has successfully created a round boiler in which hot water rises from the centre towards the external surface. On the Earth this does not happen because the force of gravity prevents it. In space, because of the absence of gravity it is possible to study the effects of fluid dynamics that are normally hidden by the force of gravity. Other experiments are dedicated to the study of radiations in space. In fact, the astronauts are subjected to enormous amounts of radiations that are much greater than those affecting pilots of transoceanic airlines. During the studies also the effects of these radiations on the human body are evaluated. After a couple of hours at work, at around 10 a.m. GMT, Luca begins his session of about one and an half hours of physical exercise. The exercises have been scheduled to prevent the heart from becoming weak and the muscles from becoming atrophic, because due to the absence of weight, there is no contrasting gravity to pump blood in the body or to move a muscle. Furthermore, a great effort is made to avoid any decrease of calcium in the bones. Even though this unfortunately is inevitable. 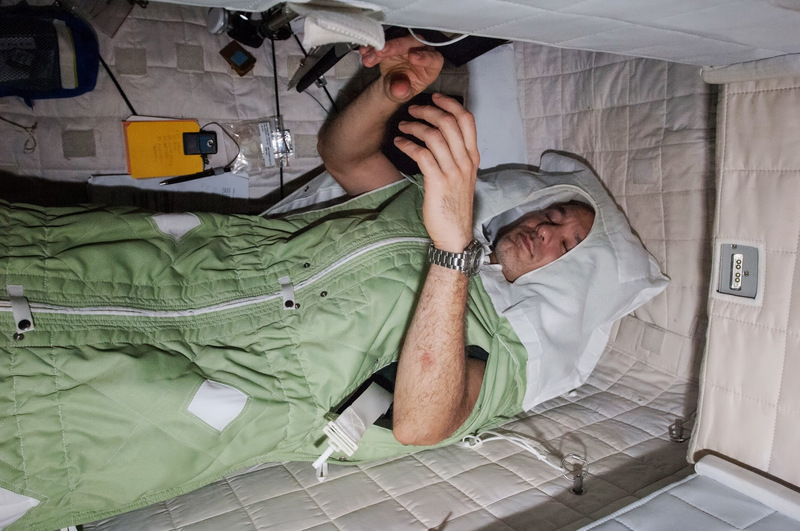 For astronauts like Luca, who must face missions lasting a long time, there is a rehabilitation period, when they return to the Earth, before they can walk again. In fact, once they land on the Earth, they are taken from the spaceship that brings them back to Earth and carried on special stretchers in order to prevent any bones from breaking. There are numerous exercises – from riding a classic cyclette exercise bike, to running on the T2 , a treadmill that simulates walking and running in normal gravity conditions. 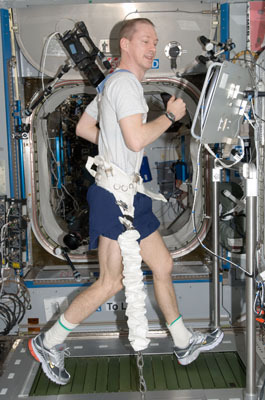 In fact there are elastic straps that keep the astronaut on the treadmill, preventing the astronaut from shooting off to the ceiling with the first step. Then there is a cyclette to exercise arms and legs, and this too has straps to keep the astronaut in a seated position. The astronauts can also carry out bodybuilding routines with ARED (Advanced Resistive Exercise Device) an exercising machine that uses the principle of vacuum pumps and in fact has two air-tight calibrated pistons, which enable weight lifting exercises. 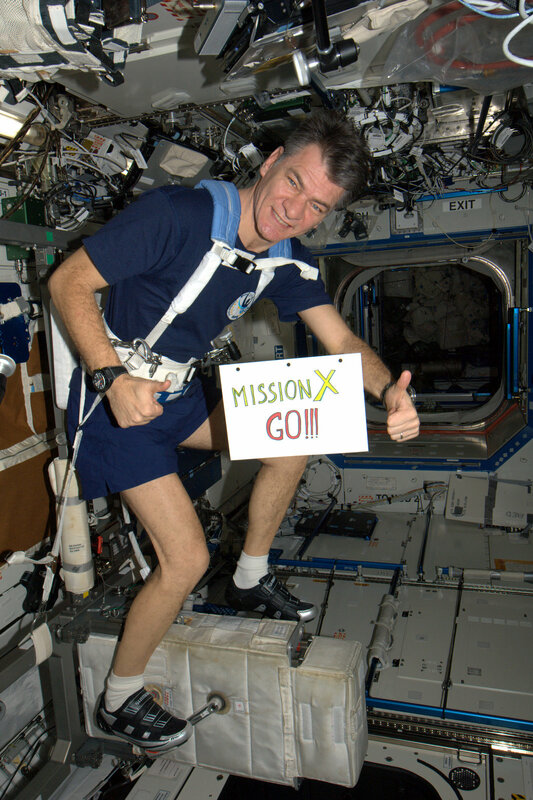 The physical fitness of each astronaut is constantly monitored by a team of doctors on the Earth, who record any changes in the physical parameters, and, if necessary, they prescribe changes in the astronauts’ exercise routines. Three food-breaks are programmed: breakfast, lunch and dinner. However, drinks and snacks are always available. 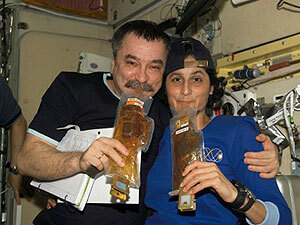 Over the years, food for astronauts has changed even in terms of quality. In the beginning it consisted mainly of lyophilized food, to be rehydrated with equipment to heat water. Fresh vegetables were practically inexistent. Today the situation is decidedly different. 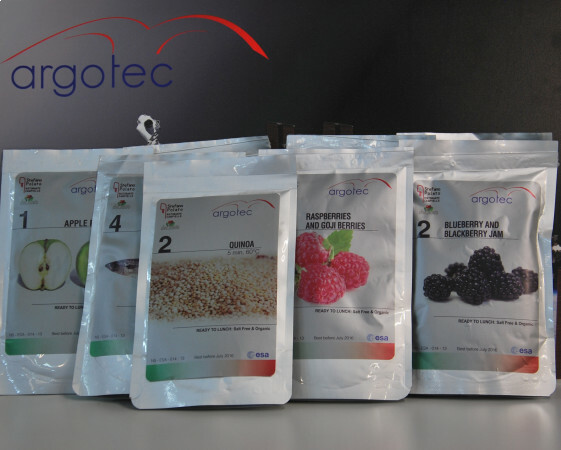 Specialized companies prepare the astronauts’ meals. For example Luca likes to eat light food, for lunch he is quite happy with two small tortillas rolled around some tuna fish, salmon and some vegetables. No bread can be eaten, nor any foods that produce crumbs, because these would scatter around the cabin, also creating problems for the instruments. Every astronaut is allowed a special food, Franco Malerba, the first Italian astronaut on board a Space Shuttle in 1992, took some parmigiano reggiano cheese cut in cubes along with him. The astronaut Samantha Cristoforetti, the first Italian woman astronaut, has already defined the menu for her long term mission in space which will begin in November 2014. She will eat mixed berries, apples, quinoa and mackerel, vegetables, chicken, brown rice, puffed cereals and dry fruits. Whatever food Luca eats, he always has the sensation that he does not feel the taste that much. This is exactly what happens as in absence of gravity, the body liquids stagnate as in a horizontal pipe, as there is no gravity, they all have the same pressure. The result is that the astronauts constantly feel their nose is closed.Strong flavours for strong stomachs are probably what is needed! During the day, the three members of the crew take turns to take a break and relax. During this time they read, they follow their social network, they take part in conferences with journalists, politicians, students or they carry out their favourite activity, they photograph the Earth. At the end of the day at work, Luca takes a relaxing shower. Not really. Forget those images of hot water pouring on your body, and like in a massage, toning up and regenerating your body. To prevent the water of the shower from invading the cabin, and sticking to the surrounding walls, and on the electronic equipment, it must be confined so that it does not splash. So Luca must enter a cabin that is separated from the rest of the living space, where water vapour is created. The water droplets that are suspended, in absence of gravity, take up a spherical shape, and Luca enters the cloud of small bubbles. To wash up he must catch the droplets and squash them against his body, rubbing them on his skin. But this is not all. In order to dry himself, Luca must eliminate the droplets that stick to his skin with special cloths. In other words a shower is not as relaxing as it may seem! A curious detail: all the water, even the water used for the shower is brought from the Earth on special automated vehicles such as ESA’s ATV. For this reason water, including shower water, is recycled and used for preparing food and drinks. Also the astronauts’ urine is purified and recycled. It is 8 p.m. GMT, soon Luca will go to sleep. He still has some time to send a few e-mails and to classify some photographs and publish them on the social networks. Before going to sleep he talks to his wife on Earth. This is an important part of the day, in which for a few minutes family intimacy is created. They talk about their experiences and share the difficulties faced during the day. It is 9 p.m. now Luca can fall deeply asleep. He has his small cabin to sleep in, it has a little window with a view of the Earth. For Luca it is an important moment of the day, because seeing the Earth always touches his heart, and he feels proud to represent his nation in such an important mission. The thinks how absurd it is to wage wars, dividing people. Everything seems so futile and incomprehensible. He says, “if everyone could have this experience, perhaps there would be no wars”. And now it is really time to sleep. By now you must have understood that all that is simple and natural on the Earth is quite complicated on the ISS. Luca has to slip into a sleeping bag that is anchored to the cabin to avoid hitting around the cabin while he sleeps. And he also must wear a mask, because the LEDs of the electronic equipment light up the cabin, and he must wear ear plugs if he wants some peace and quiet. Some astronauts have said that it is impossible to sleep without taking sleeping pills.